In recent years a dramatic shift has occurred in the collection and analysis of intelligence by government spying agencies. In addition to normal clandestine methods (cloaks and daggers and whatnot), governments around the world have come to recognise the value of ‘open source intelligence’: finding, selecting and acquiring information from publicly available sources to produce actionable intelligence. What’s useful and cheap for governments can be useful – and attainable – for people interested in the big issues in society. The UK’s public broadcaster the BBC has this month commissioned a study into representations of lesbian, gay and bisexual (LGB) people in its fiction and non-fiction programs (BBC News, 2010). Of particular interest to science communicators is representations of scientists in fiction, and this study seems a timely prompt to ask: are there any queer scientist characters on telly? 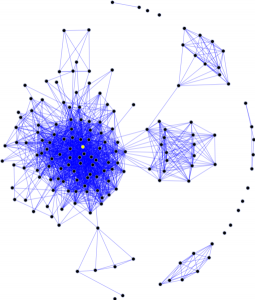 There’s a lot of evidence these days that shows that social networks (the connections you have with your family, friends and colleagues, and more broadly with society at large) and social capital (the extent to which trust is contained within those connections) have an enormous impact on individual, organisational and societal outcomes. It has become more and more common to apply the knowledge gained from the study of social networks and social capital to the science innovation landscape. This allows us to study the flows of science knowledge within scientific circles, between different disciplines, between scientists and policy makers, and between science and the public. 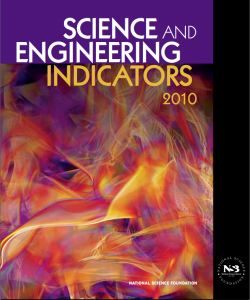 The US National Science Board has just released Science and Engineering Indicators 2010, reporting broad trends in the global science and technology landscape to 2008 (pre Global Financial Crisis). In general, the report shows a continuation of the pattern of the last two decades: an increase in the role of research in developed and developing economies, and the emergence of Asia (and particularly China) within this landscape. See over the fold for a few selected graphs.